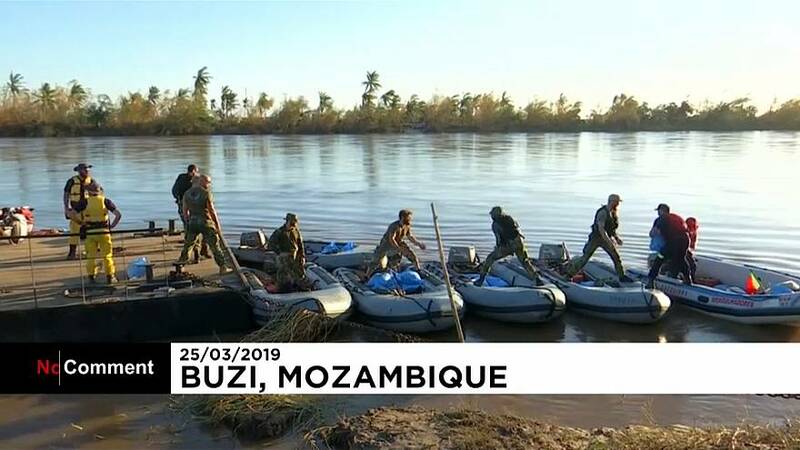 The Portuguese navy delivered 800 kilograms of aid to hundreds of people in Buzi, southwest of Beira in Mozambique on Monday (March 25). In areas west of the port city of Beira, hundreds of people were trapped for more than a week after Cyclone Idai hit, surviving in vast tracts of submerged land with no access to clean water and shrinking food supplies. Water has been slowly receding and there was no rain in Beira on Monday, meaning some roads have become passable. But the size of the disaster zone means getting aid to the neediest is still difficult. The Portuguese navy has made two trips to deliver supplies to the area of Buzi, taking over one and a half hours to reach the people waiting desperately for aid.